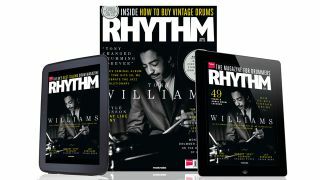 This month we pay tribute to one of the greatest of them all - Tony Williams. In honour of the 50th anniversary of his iconic Life Time album, we celebrate the life and pioneering drumming of Tony Williams, through the words of his illustrious bandmates and friends. Learn to play Paramore hit 'Ain't it Fun', Herbie Hancock classic 'Cantaloupe Island' and 'Bark At The Moon' by Ozzy Osbourne. Plus, there's all of your usual favourite lessons from Colin Woolway, Adam Bushell, Pete Riley, Ajay Naik, Jason Bowld, Erik Stams, Mike Sturgis and more. Win a Natal cajon worth £99. All this and more in the June issue of Rhythm available now from all good newsagents, online or digitally at the Google Play Store or from Apple Newsstand. Get yourself a copy from Apple Newsstand and enjoy all of our tuition content plus bonus videos, image galleries and other content.